THANKS TO the mines there’s a lot of spare coin floating around in Western Australia these days, which means some guys and girls have a little bit extra to tip into their modified cars. But having a cool car is no fun at all if there’s nowhere to enjoy it. 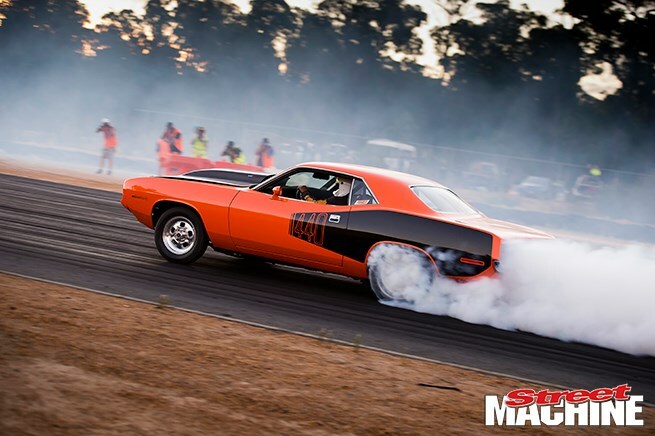 To help things along, the team from Gazzanats put on their special blend of high-octane entertainment at the Collie Motorplex, 200km south of Perth, and with 220 entrants there was plenty of entertainment to be had. Powerskids and burnouts are the most popular events, but the track cruising sessions are a great opportunity to enjoy your ride with friends and family in relative safety. Not everything goes to plan though, as Chris Michel found out when his light blue Torana rolled during a powerskid session. He was okay, but the car was severely damaged. As a Summernats 28 Burnout Masters qualifying event, there were three ‘Golden tickets’ on offer with the recipients heading straight into the prestigious National burnout Masters. Those tickets went to Darren Williams with his XF Falcon ute, Damian Picioneri and his XD Falcon and Kevin Mantach with the ALCOTRAZ supercharged Holden tonner. We’re looking forward to seeing them there.